In 1943 the little-known port of Marchwood was born on the far side of Southampton Water in Hampshire. At the time, every little creek and inlet was being used to gather equipment and men, ready for loading onto the landing craft that would ferry them across the English Channel to the Normandy beaches the following year. With the coming of peace in 1945, Britain still had an army of occupation to support, and the need for a continuing military presence at Marchwood was assured. 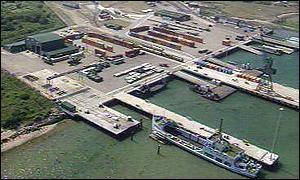 The port came into its own once more in 1982, when Argentina invaded the Falkland Islands. While the world watched as soldiers and marines boarded the QE2 and Canberra in Southampton, and pictures of the Task Force sailing from Portsmouth were flashed around the globe, the job of loading all the equipment the troops would need for the fight ahead was taking place largely unnoticed at Marchwood. It was so importance to the war in the South Atlantic the government invested tens of millions of pounds upgrading the base after the conflict. Up to 100,000 tonnes of cargo passed through in a typical year: supplies bound for Germany; tanks being shipped to Canada for British Army training; heavy equipment arriving home during the pull-out from Hong Kong; other loads bound for the last remaining overseas bases in Cyprus or the Falklands. While armoured cars and tanks have arrived by road, special trains roll into the base laden with ammunition. Once inside, the job of handling what is in effect a huge ferry port and railyard, falls to the 600 soldiers of the Royal Logistic Corps based here and the 150 civilians who support them. Marchwood is home to the Royal Fleet Auxiliary's five landing ships, perhaps most famously the Sir Tristram - nearly sunk by Argentine bombs in the Falklands - and the Sir Galahad. Each is a military version of the roll-on, roll-off ferry you might catch on your holidays. More often these days, operations like those now taking place in the Balkans require far more heavy equipment than the existing landing ships can carry, so two new vessels have become regular visitors to Marchwood. Sea Crusader and Sea Centurion are as big as any ship in the Royal Navy. Built in Japan and Italy, they have been chartered by the Ministry of Defence and are operated by merchant crews from the Royal Fleet Auxiliary. Previously, sending soldiers and their equipment overseas meant taking a chance bidding for whatever civilian vessels could be hired. A shrinking British merchant fleet made that a problem. Overseas owners were also often reluctant to risk expensive ships in war zones like the Gulf without extra insurance cover. Sea Centurion was only chartered last December and immediately found herself at Marchwood. Her first job was to carry the equipment for UK troops being sent to Macedonia to protect the OSCE peace monitors then operating in Kosovo. Since then, they have moved tanks and other heavy equipment along the same route, with more expected to follow as part of the Nato ground force build-up in the coming weeks.